It's the end of our farmers market season and one of the things we are going to miss is the sweet potato and black bean tacos from Chef Shack. We've tried making versions at home, but they were never quite right until this week. This time I think we really got it. Roasting the potatoes with a spices and then turning them into a mash makes them the perfect sweet base for the savory beans, peppers and onions. I had a hard time stopping myself at just two of these! Peel the sweet potato and cut into about 1/2" cubes. Put in a small roasting pan. Add enough olive oil to coat all the cubes. Stir in a pinch of kosher salt, the ancho powder and the cumin. Roast in the oven for 25 - 30 minutes, until tender enough to mash. Mash with a fork or potato masher. Put 1 T olive oil in a skillet. Heat over high heat. Add the peppers and onion. Sauté until everything is starting to get brown around the edges. Heat the tortillas either in the microwave or on a griddle. Top with the sweet potato mash, beans, and vegetables. Add optional toppings as desired. I like just the yogurt and don't think it needs the extra calories from the cheese. Matt likes the cheese and extra spice. I actually make enchiladas fairly often with a combination of roasted sweet potatoes, black beans, and veg (gotta blog that someday, speaking of which). Such a winning combination -- bet these are just delicious! Mmm. My kind of taco. I need a bit more hot sauce though. There is something amazing about the combination of black beans and sweet potatoes. I like you addition of fried peppers. This is a must try. i always considered this combination one of my random obsessions that no one else would ever like--what a surprise that you enjoy it too! 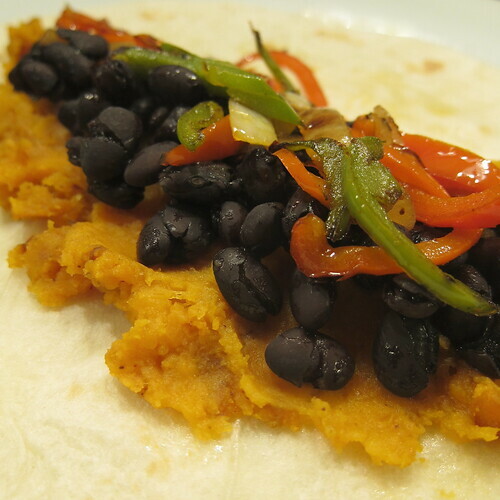 I've developed a love of black beans and already love sweet potatoes so what's not to love in this taco? One of my favorite flavor combinations! We used to get BB and SP burritos from our farmers market in FL, and they had the most amazing habanero sauce to put on top! Love the sweet potato black bean combo, but hadn't thought of doing it in a taco. Great idea! Love the idea of a different use for sweet potato. Thanks for the inspiration.